Tomorrow we honor the Ringbearers and their great burden at our first Conference event of 2018 with Guest Presenter Professor Nicholas Birns. The doors open at 12pm, and our program A Great Burden Without Guidance: The Six Mortal Ringbearers begins at 12:30. After the presentation, and a lunch break, we welcome everyone to join us for readings from the work of J.R.R. Tolkien. If you have a favorite passage you would like to share with attendees then by all means please bring it along. As we are roughly 17 hours away before the doors open we wanted to offer a few reminders about tomorrow’s event. We look forward to having you all, and if you are attending please be sure to register, this event is FREE but registration is required. Tolkien Reading Day Celebration with recordings of Tolkien reading, and attendees reading passages from Tolkien’s work. 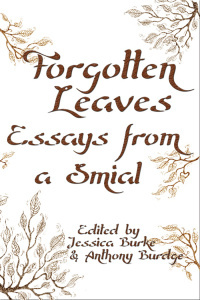 Professor Birns is not only a contributor, but compiled the index as well for the Tolkien essay collection Forgotten Leaves Essays from a Smial. Myth Ink Books will be on hand with copies of Forgotten Leaves available for purchase. Professor Birns and other contributors will be in attendance to sign your copy if you wish. Additionally Myth Ink Books will have Tolkien calendars, issues of the Journal of the New York Tolkien Society, and other fiction/non-fiction books available. We look forward to gathering with you all once again as we kick off our 2018 event season, and stick around at the end of the program for a preview of upcoming events.